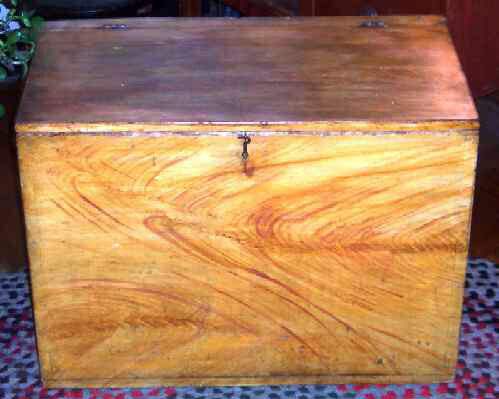 Presented here, a very fine grain painted Wood Box in mustard and redish-brown paint. Even the interior of the lid is painted! The paint is in exceptional condition with only some minor wear due to age and usage. I believe it was originally, or at one time used as a wood box because of the wear on the interior from the wood being put into it. It is 26" long x 14-1/2" deep x 19" high. Dovetailed construction with big old square nails. There is a small metal repair over a knot hole on the back and the top has been reinforced with two runners of wood so it is very sturdy and sitable. The interior of the box is very clean. Besides being used for wood storage next to the fireplace this box would make an excellent toy chest and if I had the room it would be in my kitchen used to hold the dog's food! Also, it is the perfect height to sit under a window or even by the back door to hold the kid's boots and then be able to sit on it while the boots are put on. This is one of those wonderful pieces that have a multitude of uses, all while being very easy on the eyes.